Survey Results: How Many Developers Write Unit Tests? The results of the survey show that indeed most developers do write unit tests. In fact it appears that most have good to great test coverage and spend a large amount of their time (for some it is quite significant) building their test suites. 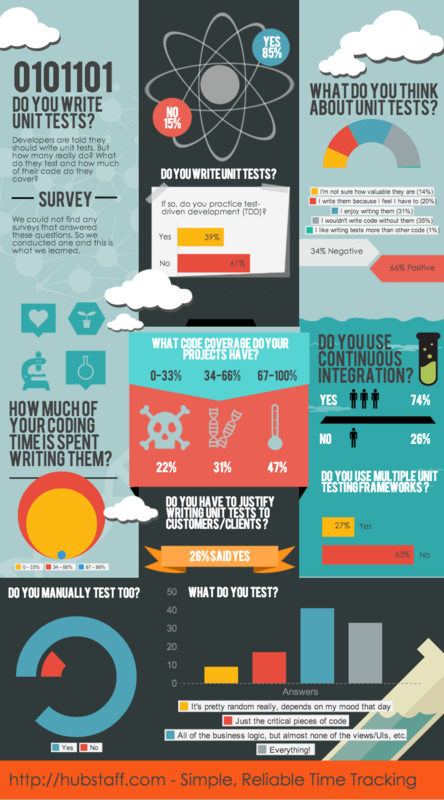 The one surprise for me was that only 39% of developers use the test driven development methodology. So the state of the testing culture among developers appears strong. If you are not writing unit tests yet you may want to ask yourself why you are in the minority. How do you compare to the results in this survey? Answer the survey questions by leaving a comment below. : Most of the comments were on the Hacker News and Reddit posts.